Quakertown, PA, October 10, 2009 – PneuMagnetic, a manufacturer of valve operating solutions and solenoid valve actuators, announces a revolutionary actuator design that achieves dramatic cost reductions in the installation of valves used in hazardous environments. The patented PneuMagnetic Actuator reduces installation cost by almost 50% in intrinsically safe (IS) installations, and by almost 20% in explosion proof (EX) installations. Unlike typical pneumatic actuators, its use is not restricted to factory-built pneumatic valves. Rather, it can be used as a direct drop-in replacement for the OEM coil on any direct acting solenoid valve. 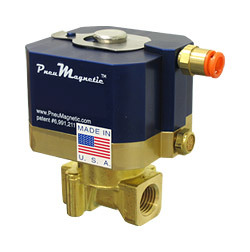 The PneuMagnetic Actuator is fully compatible with any original hermetically sealed valve. The PneuMagnetic Actuator substantially reduces the cost of valve installations in hazardous environment. Valves converted to PneuMagnetic are operated by an inexpensive air pilot using a small diameter, flexible pneumatic line. No field wiring, conduit, or intrinsically safe (IS) barriers and no electricity at the valve are required. The PneuMagnetic Actuator's sealed design, combined with the fact that it works with hermetically sealed (packless) direct acting valves, allows it to offer extremely high reliability. By essentially converting solenoid valves to pneumatic valves, PneuMagnetic technology dramatically expands the variety of valves available to the user. The PneuMagnetic Actuator is less bulky than either pneumatic rotary actuators or pneumatic valves, reducing space requirements. Altonji noted that in hazardous installations including explosion proof (EX) and intrinsically safe (IS), this cost and complexity can be avoided if direct acting solenoid valves are converted to operate with the PneuMagnetic Actuator. “Traditional electric installations require extensive material, labor, space, and time to install” said Altonji. “When compared with explosion proof (EX) or Intrinsic Barrier (IS) designs, the PneuMagnetic Actuator offers the lowest installed cost”. The PneuMagnetic Actuator is available for use with a wide range of valves including ASCO®, SMC USA and Parker-Skinner solenoid valves.